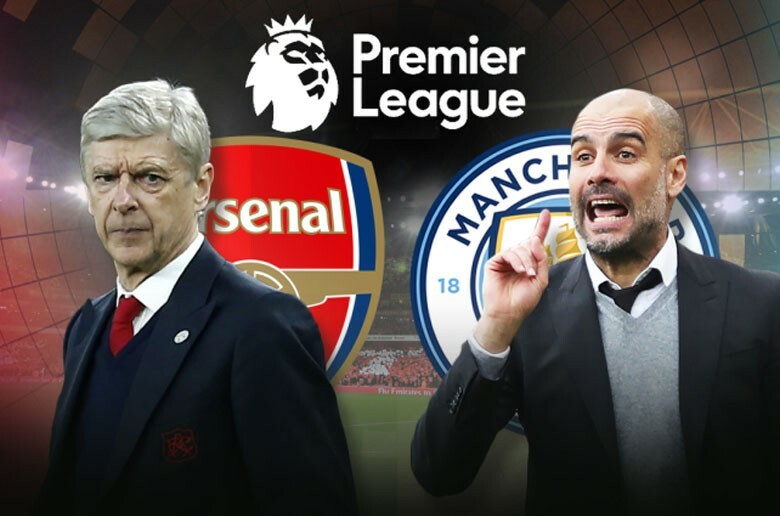 Arsenal fans are beginning to believe they stand a chance against Manchester City when both teams meet in the Carabao Cup final on Saturday at the Wembley stadium. Having seen Manchester City defeated by championship side Wigan Athletic in the FA Cup fifth round, Arsenal fans now believe that Wenger’s men could draw inspiration from the Wigan side. Arsenal manager is yet to win a League cup trophy since he became Arsenal manager in 1996 and he will be doing everything against the Citizens to ensure his team emerge victorious against the Premier League runaway leaders. Manchester City were on course to win four trophies by the end of the season before their encounter against Wigan last night where they were surprisingly bundled out of the FA Cup competition after losing 1-0. Pep Guardiola’s men are certainly furious about their performance last night and they will hope to return back to winning ways when they tackle the North London club at the Wembley stadium. After losing to the minnows last night, Manchester City and Argentina forward Sergio Aguero was seen to have involved in an altercation with a Wigan supporter and the incident hasn’t gone well with Arsenal fans as the call for the player’s suspension. One of the Gunners fans tweeted that the FA should look into the incident and they should suspend the player for just a game. Arsenal are through to the Europa League semifinals after they saw off Italian Serie A giants Napoli in their quarterfinal tie. The Gunners faithfuls would have expected a much tougher test from the second best team in Italy but the Arsenal players made light work of the threat posed by Napoli over two legs. Arsenal had won the first leg of their quarterfinal tie at home via a 2-0 victory made possible by goals from Aaron Ramsey and Kalidou Koulibaly (own goal). The comfortable lead was not in danger throughout the second leg meeting which ended in a 1-0 win for Arsenal. French international Alexandre Lacazette was brought down outside the Napoli box and he stepped up to convert the resulting freekick to give the Gunners a 36th-minute lead. Arsenal were able to preserve that lead to seal a 1-0 win on the night and a 3-0 aggregate victory over their Italian opponents. The Gunners will now face Spanish La Liga club Valencia in the last four of the competition. Arsenal manager Unai Emery will face his former club while ex-Gunners players like Francis Coquelin and Gabriel Paulista are on the payroll at Valencia. The Gunners host Valencia in their first leg before both teams face each other again in Spain for the second leg to determine this year’s Europa League finalists. Arsenal manager Unai Emery has praised the way that summer signing Sokratis Papasthathopoulos has been able to adapt to life in England following his move to the Gunners at the start of the season. The Gunners boss lauded the impact of the Greek international on the Arsenal team during his pre-match press conference ahead of the Napoli game in the Europa League. Sokratis Papasthathopoulos signed for Arsenal last summer after the Gunners paid around £17m for his signature. The Greek centre back joined Arsenal from German Bundesliga club Borussia Dortmund and he has been a key player for the North Londoners since his transfer last summer. Sokratis will return to the Arsenal starting XI for the away game at Napoli in the Europa League after he missed the league match at Watford on Monday night. He was banned for two Premier League games after accruing ten yellow cards since the start of the season. The Greek defender missed the 1-0 win over the Hornets and will also sit out the home game against London rivals Crystal Palace. Sokratis and Arsenal take a 2-0 lead to Naples from the first leg. A 15th-minute strike from Welsh international Aaron Ramsey and an own goal from Kalidou Koulibaly gave the Gunners a comfortable advantage ahead of the second leg on Thursday night. 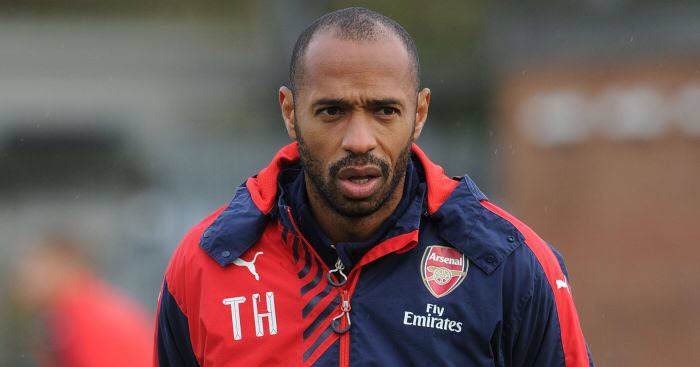 Former Arsenal striker Thierry Henry has been linked with the managerial job at Major League Soccer (MLS) club New York Red Bulls but recent reports claim that the club is not looking to make a change in that department. According to MLSoccer.com, the Arsenal legend is unlikely to take over the New York Red Bulls managerial job. Thierry Henry attained legendary status at Arsenal after he finished as the Gunners’ all-time topscorer during his two spells at the club. He was a pundit with Sky Sports before he resigned from the job to concentrate on his managerial career. Thierry Henry was the assistant manager with the Belgium national team setup under manager Roberto Martinez. The Frenchman was part of the coaching crew that masterminded a third-place finish for the Red Devils of Belgium at the 2018 FIFA World Cup tournament in Russia. Henry took the managerial job at French Ligue 1 giants AS Monaco but didn’t spend more than three months before he was sacked. The former Gunners striker was previously a player at AS Monaco before his ill-fated spell at Juventus. Thierry Henry went on to join Arsenal from the Italians in 1999. The Arsenal legend was replaced by Leonardo Jardim at Monaco earlier this year. North London giants Arsenal would be hoping to banish their away day blues when they travel to take on fellow Europa League favourites Napoli in the second leg of their quarterfinal tie. Arsenal lead 2-0 from the first leg but their poor away record in the knockout stage of this season’s Europa League has the Gunners faithfuls fretting ahead of the second meeting with Italian Serie A giants Napoli. Aaron Ramsey and Kalidou Koulibaly (own goal) got the goals for the Gunners when both sides met last week Thursday. Arsenal warmed up for their game against Napoli with a largely unconvincing 1-0 win over Watford on Monday night. The Gunners’ topscorer Pierre-Emerick Aubameyang scored the only goal of the game to secure three points in the race for Champions League football via a top-four finish on the Premier League table. Gabonese international Aubameyang has now scored 23 goals in all competitions for Arsenal. Napoli also won their last league game, a 3-1 away win over Italian Serie A bottom club Chievo Verona. Arsenal are second favourites ahead of the Napoli game at the odds of 4.70 according to Surebet247. A Napoli victory is at the odds of 1.66 while the possibility of a stalemate is at the odds of 4.20 as confirmed by Surebet247. North London giants Arsenal are up to fourth spot on the Premier League table after the Gunners sealed a 1-0 win over Watford in their Premier League clash at Vicarage Road on Monday night. Arsenal knew that an away victory over Watford will take them into the top four places on the Premier League table and that was what they recorded against Hornets side that finished the game with ten men. The Gunners took an early lead through a 10th-minute strike from Pierre-Emerick Aubameyang who profited from a goalkeeping error from the Watford goalkeeper Ben Foster. Aubameyang has now scored 18 goals in the Premier League this term and only Liverpool forward Mohamed Salah and Manchester City striker Sergio Aguero have scored more (19). Watford were then reduced to ten men when their captain Troy Deeney was sent off for an elbow on Arsenal midfielder Lucas Torreira. The hosts held their own against Arsenal despite playing the majority of the game with a man down. Watford hit the crossbar twice while Arsenal goalkeeper Bernd Leno made several saves to keep the advantage for the Gunners. The win over Watford takes Arsenal above London rivals Chelsea and into fourth spot on the Premier League table. Arsenal also kept a clean sheet for the first time this season away from home. Watford manager Javi Gracia has leapt to the defence of his captain Troy Deeney after the Hornets striker was sent off during the defeat to Arsenal on Monday night. Deeney was sent off in the first half of the game shortly after Arsenal took the lead via an error from Watford goalkeeper Ben Foster. He was dismissed for an elbow on Arsenal midfielder Lucas Torreira. In his post-match thoughts after the game, Javi Gracia told reporters that the red card given to Troy Deeney by centre referee Craig Pawson was harsh. Troy Deeney’s dismissal came shortly after Arsenal took the lead through Pierre-Emerick Aubameyang. Former Borussia Dortmund and Saint Etienne star Aubameyang capitalised on an error from Watford shot-stopper Ben Foster to give the Gunners the lead in the tenth minute before the incident that led to Deeney’s dismissal one minute later. Despite playing 80 minutes with ten men, Watford played very well against the Gunners and were denied a well-deserved equaliser by the combination of woodwork and good goalkeeping from Arsenal shot-stopper Bernd Leno. Arsenal held on for the slim win to record only their sixth win on the road in the Premier League this term and the victory made sure that they will stay in the Premier League top four until the weekend at least. Arsenal star Sead Kolasinac has dismissed transfer reports linking him with a move away from the club when the transfer window reopens in the summer. In his recent interview as monitored by popular media outlet Goal, Bosnian international Kolasinac shut down those rumours. Recent reports claim that Arsenal manager Unai Emery wants to sign a new left-back when the transfer window reopens this summer. Sead Kolasinac has been able to recover from a long-term injury at the start of the season. The former Schalke 04 star suffered a serious knee injury during preseason last year and Arsenal struggled to replace him at left-back. Sead Kolasinac missed the first two months of the season as a result of the knee injury. Fellow Gunners left-back Nacho Monreal was also out of action for some weeks at the start of the season. Since his return from injury in October 2018, Sead Kolasinac has been in good form for the North Londoners though that has not stopped the transfer reports about his future at the club. Kolasinac and Arsenal are chasing a top-four spot on the Premier League table which will secure Champions League football. The Gunners are also in the Europa League where they will take on Italian Serie A side Napoli in the second leg of their quarterfinal tie on Thursday night with Arsenal leading 2-0 from the first leg. North London giants Arsenal will have to fend off the threat of one Premier League club in their quest to sign Bournemouth midfielder Ryan Fraser. According to the publication from trusted media portal Goal, Newcastle United have joined the Gunners in the hunt for Ryan Fraser who has had a very good season for the Cherries this season. The Scottish national team player is one of the leading assist providers in the Premier League this term. Fraser has scored eight goals in addition to twelve assists in the Premier League this term. The aforementioned report revealed that Newcastle United are eyeing a summer swoop for two Bournemouth players. It was revealed that the Magpies want to sign both Ryan Fraser and David Brooks. Both Brooks and Fraser were on the scoresheet for Bournemouth in their last league game, a 5-0 away win over struggling Brighton and Hove Albion at the weekend. The win over the Seagulls was the biggest victory for Bournemouth away from home in the Premier League. Newcastle United manager Rafael Benitez wants to strengthen his midfield this summer with several Magpies midfielders set to leave the club when the transfer window this summer. The likes of Jonjo Shelvey and Isaac Hayden could leave Newcastle United this summer. Arsenal striker Pierre-Emerick Aubameyang has set his sights on winning the Golden Boot Award at the end of this Premier League season. The Gabonese international told Sky Sports reporters about his desire to win the Golden Boot Award though he was quick to point out that it would be hard for him to win the accolade for the scorer of the most goals in the Premier League this term. He talked about his quest to win the Golden Boot shortly after the former Saint Etienne and Borussia Dortmund star led the Gunners to a slim win over Watford in their Premier League meeting at the Vicarage Road on Monday. Pierre-Emerick Aubameyang scored the only goal of the game to give the Gunners the points and also propelled them to the top four places on the Premier League table. Arsenal are above London rivals Chelsea on goal difference (both on 66 points) despite the fact that the Blues have played a game more than the North Londoners. Manchester United are two points further back in sixth place as the race for the top-four continues to serve up intrigues. Tottenham Hotspur are the fourth team in the race and they are in third position with 67 points. Only three points separate the four teams on the Premier League table. Watford shot-stopper Ben Foster has apologised for his mistake which led to the only goal of the game against North London giants Arsenal in their Premier League meeting at the Vicarage Road on Monday night. The England international goalkeeper was charged down by Arsenal striker Pierre-Emerick Aubameyang before his hurried clearance cannoned off the Gabonese international player and into the back of the net. After the game, Ben Foster told reporters about the apology to his Watford teammates shortly after the game. The setback happened around the 10-minute mark and Watford faced further problems when captain Troy Deeney was dismissed for his elbow on Arsenal midfielder Lucas Torreira. Watford backed their players as they fought hard for a route back to the game with ten men. Arsenal created the best chances of the game especially in the second half but Watford put the Gunners under pressure for the large parts of the game. Gunners shot-stopper Bernd Leno made some vital saves to preserve the lead for his team. The win was a crucial one for Arsenal who is eyeing a top-four spot in the Premier League. They are now in the top four as it stands in the Premier League. Arsenal were able to keep a clean sheet away from home for the first time this season.